One of the more enjoyable business books I’ve read recently is Jonathan Salem Baskin’s Branding Only Works on Cattle: The New Way to Get Known (and drive your competitors crazy) ( New York: Business Plus, Hachette Book Group, 2008). Drawing on his decades of experience in marketing, Baskin takes an iconoclastic approach in exposing the folly of modern views on marketing and the illusion of branding. Baskin challenges the mystical notions of branding in which consumers are supposed to develop deep emotional associations with products beyond the logic of utility. Commercials aimed at merely creating associations or “brand awareness” ultimately fail to drive sails. Like the troubling Burger King mascot with a crown, many of the images used to promote brands do nothing but waste our time and corporate dollars. “Most branding is a waste of money,” he insists (p. 14). “Branding is based on an outdated and invalid desire to manipulate and control consumers’ unconscious. It looks good and feels food to the people who produce it, but it has little to no effect on consumer behavior” ( p. 14). He argues that rise of branding occurred during a brief era in history after the rise of network TV and other centralized media, when consumer information really was tightly controlled through a few major channels. During that brief era, a few major channels of information dominated what we learned about products and left us at the mercy of advertisers. But now, as we return to the way things almost always have been, with many fragmented sources of information based upon people’s experiences with products (think the Internet, instant messaging, and the return of other less centralized ways of interacting), what matters most – once again – is not our metaphysical relationship with a brand at some subliminal level evoked by exposure to abstract and often meaningless ads, but the performance and value of the products. Private brands (in store brands) have been with us for years, but it is only recently that they have really mounted a massive assault on established brands. Major manufacturers are learning that they must work harder than ever before to offer differentiable products that justify the premiums they want or need to charge. Some retailers have foreseen the power of private brands and have worked aggressively to form the partnerships and skills needed to bring private brands to a new level. In the news now, we see Safeway offering some of its private brands to other retailers, a wonderful example of innovation in business models and of magnifying the profit potential of unique skills and value chains that have been developed. We see Wal-Mart announcing bold new plans for expanding their already extensive private brands, a move which may have many old-school marketers of national brands trembling. We also see 7-Eleven announcing the role out of over 100 new in-store products that will compete with national brands. There planets are shifting in the retail solar system, with bodies orbiting around a new gravitational center in the cosmos of consumer products: private labels. This is not to say that national brands are dead, but the pressures and threats are evolving, and they must evolve rapidly to avoid death nipping at their hills. We will see interesting new coalitions between national brand manufacturers and private label manufacturers, and perhaps an increasing emphasis on non-commodity aspects of consumer products such as improved packaging, novel dispensing, novel functional ingredients, and new business models for co-packaging, cross-promotions, and other ways to add value and meaning to threatened national brands. Cheerios: Another Drug to Regulate? Posted by: Jeff Lindsay | Comments Comments Off on Cheerios: Another Drug to Regulate? The Food and Drug Administration is taking aim at Cheerios, as Advertising Age reports. After two years of advertising the health benefits of the oats in Cheerios, General Mills now faces the wrath of the FDA. By claiming that it can lower cholesterol, no matter how many studies support that claim, General Mills is allegedly transforming its product into a drug. We can understand the concerns that regulators may have with health benefits that may sound like the medicinal benefits of drug, but surely there is a place to let people know about the well-established effects of certain foods. As knowledge of nutrition grows, there are many natural foods that may be helpful in dealing with a wide variety of health issues. To stifle that information will only discourage innovation in the way we eat and in the products that companies market. Companies seeking innovation in foods have struggled with the anti-innovation impact of product labeling. When it’s a federal crime for citrus labeling to inform people that lemons may help cure scurvy, perhaps it’s time to reconsider the costs and benefits of food-related regulations. There are numerous potential innovations in food that could benefit millions if only information could be shared without the threat of FDA penalties. There are costs and benefits to be weighed, certainly, and sound food regulation is important. However, the impact on innovation is often overlooked, as are the hidden costs on consumers. Something to think about the next time you enjoy a bowl of crunchy oat-based drugs. General Mills’ response is at Cheerios.com. Comments Comments Off on Cheerios: Another Drug to Regulate? One of the nine major “Innovation Fatigue Factors” that we emphasize in the book is what we call “Breaking the Will to Share.” This describes the tenuous bonds of loyalty and trust that motivate innovators in an organization to bring forth their best ideas and breathe life into their work for the good of the organization. When trust is breached, the will to share can be lost, and even though the employee goes through the motions and appears to be working hard, real innovation can be stifled. Breaking the will to share is a silent innovation killer. We diagnose it and offer a variety of solutions while stressing the importance of staying in touch with your innovation community and listening to the “Voice of the Innovator.” Without that, you can talk innovation all day long with little hope of real progress. Innovation involves the minds – and often the hearts – of real people. They need to be respected, included, involved, and listened to. This is essential if you wish to build a healthy culture of innovation, an ecosystem where innovation can thrive and prosper for the good of all involved. 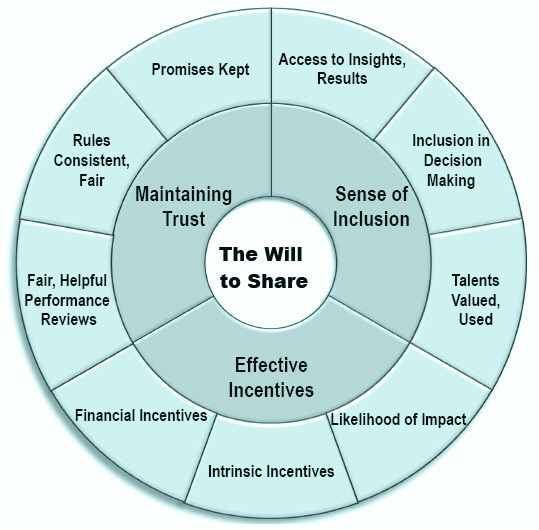 Here is one way of summarizing some of the many factors that are involved in the will to share. A form of this image is included in Chapter 6 of the book. A leader at one of the world’s most famous companies told us that breaking the will to share was the biggest barrier to innovation he had seen in his years moving up the ranks in R&D. It’s one that you cannot overlook if you want to have innovation success in your company or other institution. We think the chapter dealing with this issue, and the related insights to the personal aspects of innovation, will help you avoid this serious innovation killer and move closer to innovation success. Remember, innovation is all about human beings. It begins in the mind of an innovator, and then involves many others along the way. Ultimately, humans need to adopt it and change the way they do things because of it. Forgetting the humans in the complex equation of innovation, especially those at the beginning of the process, can result in a lot of innovation hype but little innovation success. The importance of relationships is one of enduring lessons in understanding how to overcome innovation fatigue and achieve innovation success. Relationships with the right people and partners are critical. Many fail to recognize that these must be nurtured and maintained, that time and effort is required. Learn this lesson from job seeking: it’s not enough to start “networking” when you are laid off. Your network, your ecosystem of relationships, is like a living organism. It takes time to become viable and healthy. When your network has been weak and neglected for years, without contributions and support from from you, don’t expect it to flower and yield fruit for you on demand. In Conquering Innovation Fatigue, we discuss relationships at many levels and show how the often overlooked intangibles of human relationships can encourage or suppress innovation, depending on the health of the system. As for the title of this post, well, you don’t actually build ecosystems the way you do a building. You can get them started and you can nurture them, but if they are healthy, they will grow on their own and evolve in ways you don’t expect. When it comes to the ecosystems around an organization, your real job is to create the environment where they can be healthy and grow on their own, as Verna Allee has taught. They cannot be micromanaged without harming them. The Reputation Institute has released its annual report, Global Reputation Pulse 2009, on the reputation of over 150 major corporations. The companies were in terms of seven aspects of reputation management: Products/Services, Innovation, Governance, Workplace, Citizenship, Leadership and Performance. The Reputation Pulse score is a measure of corporate reputation calculated by averaging perceptions of four indicators―trust, esteem, admiration, and good feeling―obtained from a representative sample of at least 100 local respondents who were familiar with the company. Since the study was done online and may be subject to numerous systemic errors and biases from its methodology and small samply size, I suggest taking it as only a rough indicator of what some consumers may perceive. According to the U.S. Reputation Pulse findings, a company’s reputation score has a positive and direct link to consumer attitudes and behaviors. For example, by improving its reputation score five points, a company can increase recommendations within the general public by 6.5 percent. In a competitive situation, increasing recommendations by two to five percent can have a dramatic impact on the bottom line. With 65 percent of consumers saying they would recommend one of the top 10 most reputable U.S. companies to others, organizations like Johnson & Johnson, Caterpillar and Whirlpool showed they have effectively used recommendations to drive business and reputation in a time when consumer confidence is on a continuous decline. As Consumer Goods Today observes, nine of the top 25 are consumer goods companies, and the consumer goods category leads the way in term of reputation. Good news for that sector, though again, take it with a grain of salt. NEW YORK, April 29, 2009 ― Johnson & Johnson moved up one spot to take the lead as the most reputable U.S. company on Reputation Institute’s 2009 U.S Reputation Pulse. Kraft Foods, UPS, General Mills, and FedEx rounded out the top five U.S. companies in 2009, all with excellent reputations. AIG, the beleaguered financial services firm, suffered the biggest drop in the index, finishing 152 out of the 153 companies included in the survey. Last year’s winner, Google, fell to number eight and lost significant reputation capital. Dow Chemicals and Wal-Mart saw the largest gains in reputation, improving their Reputation Pulse scores by more than 12 points from 2008 to 2009. The Reputation Pulse measures the corporate reputations of the largest U.S companies based on consumers’ trust, esteem, admiration, and good feeling about a company across seven dimensions of reputation. Last week I called a friend and inspiration, Verna Allee, the founder of ValueNetworks.com and the driving force behind many successful applications of Value Network Analysis. I was pleased to learn that ValueNetworks.com was receiving a significant honor from the IT analyst firm Gartner. The award names Verna’s organization as a “Cool Vendor” in the Collaboration category as a result of their innovation and business impact. This is very exciting news. An increasing body of companies are recognizing the need to think beyond value chains and tangible items alone, and to explore the vital world of intangible transactions that, combined with transactions of tangible elements, govern both internal and external ecosystems. The language and paradigms of the Value Network approach are all about understanding how things really work. How does information flow? How do relationships affect business? What are the barriers and incentives to cooperation? How does one build and nurture a healthy ecosystem with business partners and employees? How does one troubleshoot a dysfunctional ecosystem? Verna has been a thought leader in advancing awareness for these issues, along with practical and sophisticated tools. The three-day training I had with her and her colleague, Oliver Schwabe, a couple years ago transformed many things for me. Now when I work with a company on their innovation systems, a lot of bizarre behaviors and puzzling roadblocks suddenly make sense when Value Network considerations are applied. Verna was one of several inspirations for me in exploring the personal aspects of innovation and the sometimes hidden barriers that we call innovation fatigue factors. I cite her important work, The Future of Knowledge, in our forthcoming book, though we do not delve into holomaps and other Value Network concepts (mostly due to space limitations). But the perspective of understanding intangibles and the behaviors they influence pervade much of our work. I’m happy to again acknowledge Verna Allee for her groundbreaking work and congratulate her and her impressive team of Value Network champions for this fine award. When it comes to innovation in the business is done, Value Network Analysis is a great example of an innovative tool that is helping leaders to see and even measure things that were invisible before. Just as dark energy and dark matter are now being said by physicists to dominate the way the universe behaves, the invisible intangibles in your own ecosystem can dominate what happens, but you’ll never know about it if you rely on old tools that focus on formal roles, value chains, and transactions of tangibles alone. Of the 24 chapters in the book, nine are devoted to each of the nine fatigue factors. One chapter, for example, discusses the extremely important fatigue factor we call “breaking the will to share.” This refers to events and systems that silently shut down innovation by leaving innovators feeling alienated, distrustful, or upset with the organization. It’s a silent innovation killer because the employees or other participants in the innovation community can go through the motions and look like they are onboard, driving innovation, when they may have invisibly turned off the engines of innovation. In some cases, they hold back their best ideas for later. Part of the solution is to maintain good communication with the innovation community and listen to “the voice of the innovator.” We discuss that theme in depth, across several chapters, in our effort to help those responsible for innovation to keep the innovation community energized and aligned. You can’t afford to lose the trust and cooperation of the innovators you depend on, but it can happen easily. We have seen (and document) cases when the engines of innovation can slow down as trust is breached, even as the corporation celebrates its renewed progress in innovation. Beware this silent innovation killer and stay in touch with your innovators! Clicking on the book cover image to the left takes one to the Amazon.com site for the book. It’s one of those messy URLs, of course. 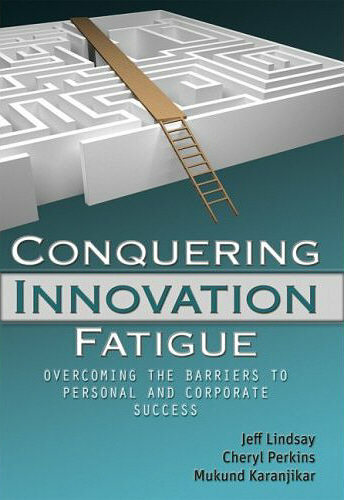 To simplify life for those wishing to tell others how to order Conquering Innovation Fatigue, we’ve created a TinyURL link: tinyurl.com/nofatigue. Tangential tip: TinyURL.com is one of many URL shorteners out there. I normally use the newer service, is.gd, when I’m using Twitter (follow me on Twitter as jefflindsay, though I also manage the bioproducts Twitter account for my role as Chair of the Forest Bioproucts Division of the American Institute of Chemical Engineers). The advantage of TinyURL is that you can create custom aliases for links if the new URL hasn’t been used already.